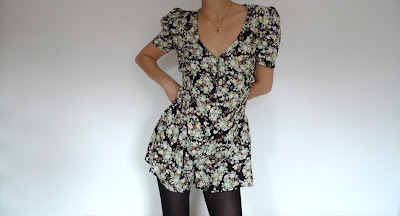 Playsuits may not be the most practical of items, what with having to literally undress each time you go to the loo, but they are sure are cute. 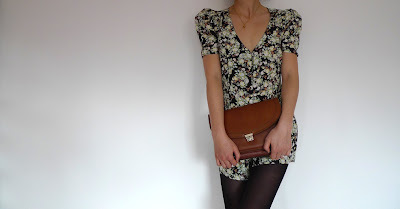 Take this vintage-looking version from Primark (yes, Primarni!) - isn't it the sweetest? At first glance, you could be forgiven for assuming it to be a flirty little dress. But look carefully and you'll notice that its gently puffed sleeves (accentuated with a smidgen of a shoulder pad) and elasticated smocked waistband define the playsuit's silhouette, pinching in the waist while matching the shoulders to the slight flare of the shorts. Add the button-front and your escape route in and out of the garment is guaranteed. This pretty floral print is perfect for work. Just add opaque tights and a satchel. 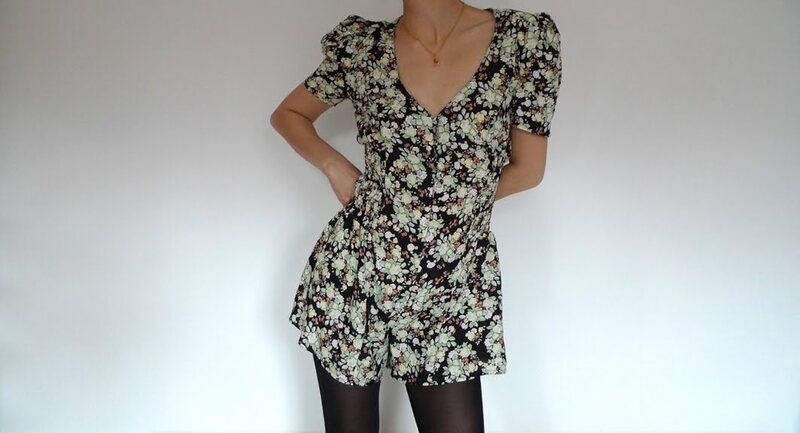 I got mine on eBay for practically the same price as the playsuit - which is just £13! And, if ditsy flower patterns aren't your thing, Primarni also does a similar playsuit in big fat polka dots - just take your pick from navy or grey. The big question is - will you dare to bare your legs when the weather warms up? I'll get back to you on that one! It would be perfect but I have horrible legs. Any good alternative without the shorts? ooh, I love playsuits, but am never brave enough to go into the mass crowds . . . I might have to go in one early morning . . If you don't fancy the shorts on a playsuit, try a jumpsuit instead. It's a versatile summer piece that can take you from the office to the bar to the beach, depending on how you wear it. As for avoiding the Primark crowds, get there first thing in the morning and it's fine. The shop's nice and tidy and fairly empty, so it's easy to find what you want. Definitely worth getting up early for.